Some awesome photographs have filtered out over the last couple of months as the world’s only two airworthy Lancasters toured the UK. ‘VeRA’, the Canadian Warplane Heritage Museum’s Lancaster, was flown across the Atlantic in early August and joined PA474 of the Battle of Britain Memorial Flight at numerous airshows and other events across the country. ‘VeRA’ was due to leave the UK around the time that this post is published, having participated in sights and sounds not experienced in at least five decades. They even arranged a rendezvous with Just Jane at East Kirkby, where 5,000 lucky people got to experience not one, not two, but THREE Lancasters with engines running at the same time. The CWHM aircraft is dedicated to the memory of a man named Andrew Mynarski, who was a 419 Squadron mid-upper gunner in June 1944. Remarkably, I recently discovered a direct connection between Mynarski and the crew of B for Baker. In June 1944 Mynarski’s aircraft was shot down by nightfighters during an attack on marshalling yards at Cambrai, France. The pilot ordered his crew to abandon the aircraft and, after giving them some time to do so, he parachuted himself. But meanwhile the rear gunner – a man named Pat Brophy – was trapped in his turret, with burning hydraulic fluid in the rear fuselage. Mynarski was about to leave the aircraft via the rear door when he saw Brophy. Without hesitation he crawled through the flames and tried to break into the turret with the crash axe. By this time his uniform was on fire and the rear gunner waved him away, but he tried again with his bare hands. But it was not enough. With time running out, Brophy screamed at him to get out. Mynarski realised it was hopeless and, because there was no space to turn around, he crawled backwards through the flames. He reached the door. He stood up. Still looking at Brophy, he slowly came to attention, clothes in flames, and saluted. Then he mouthed the words, “Good night, Sir,” and jumped. Mynarski’s clothes were on fire as he fell – and so was his parachute. While he was found by people on the ground he died of his injuries shortly afterwards. Most incredibly, Pat Brophy, the rear gunner still in his turret, survived the crash. On his return to England he was able to tell the story of Mynarski’s final act – and Pilot Officer Andrew Charles Mynarski was awarded a posthumous Victoria Cross, gazetted in October 1946. In his memory, the Canadian Warplane Heritage Museum’s Lancaster is named the Mynarski Memorial Lancaster, and carries the Victoria Cross insignia on both sides of its nose. Mynarski’s name, because it is so unusual, immediately set bells ringing. The timing matched. A quick google confirmed that the initial matched as well. But Mynarski was serving on a Canadian squadron when he met his death, and Dale Johnston and his crew ended up at 467 Squadron. And he was a mid-upper gunner at 419 Squadron, though Dale lists him as a rear gunner. I needed some more evidence. Enter Jim on the Bomber Command History Forum. He managed to pull up Mynarski’s service record (caution: 96Mb pdf) from the Archives Canada website. And there is an overlap. Dale Johnston, Ken Tabor, Jerry Parker and Eric Hill arrived at 1661 Heavy Conversion Unit – Mynarski was already there – in September 1943. Jack Purcell arrived a week and a half later. All their posting dates in and out of 9 Squadron are identical. Their paths diverge again at 1668 Heavy Conversion Unit, when Dale et al. joined Phil Smith and went to 467 Squadron on 31 December. Mynarski stayed on, leaving the HCU to a Royal Canadian Air Force depot on 20 January 1944. So we know that Mynarski’s movements were identical to those of the group of men who made up the core of the crew of B for Baker from September until December 1943. 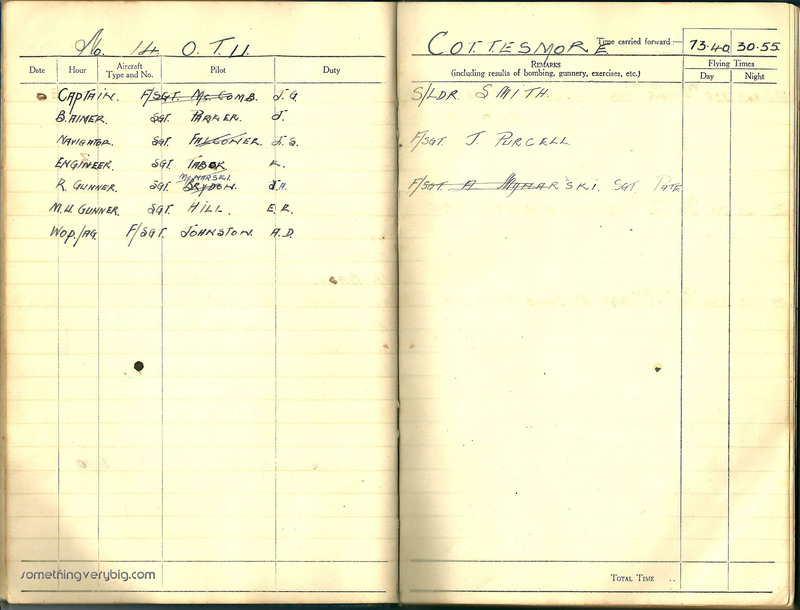 And we have Mynarski’s name in the crew list in Dale Johnston’s logbook. It would be nice to see a copy of Mynarski’s logbook to be sure (and I have feelers out to that end, but no joy yet), but the available evidence supports a strong case that Andrew Mynarski, VC, was for a few months at least, part of the crew of B for Baker. And that, if it’s possible, gives even more meaning to ‘VeRA’s recent visit to the UK. Operational Record Books are fantastic historical sources. They are extensive chronological records of everything that happened, day by day, to a squadron in an operational sense. They cover information like targets, aircraft and crews, and usually describe details of any operational flying carried out. Very useful, then, if you’re trying to trace the lives and times of a particular Lancaster crew. But they do not yield all the answers. The documents are seven decades old. They are faded, smudged, illegible and fragile, either on paper or (shudder) a microfiche machine. The information that was once there can sometimes disappear. And sometimes the information was left out, mistyped or never even there in the first place. The Monthly Summary (the so-called ‘Form 540’) in the 463 Squadron ORB records that Pilot Officer ‘Dud’ Ward received word on 9 May 1944 that he had been awarded an immediate Distinguished Flying Cross. The summary shows that the decoration was for a “grand effort” during an operation, but the date of that operation is smudged. It could be 6/7 April, or it could be 26/27 April. It’s unlikely that it was the earlier date because on that night nothing happened. The Form 540 entry for 26 April does however relate a story which is a possible candidate for the action that resulted in Ward’s DFC. After losing two engines on return from a raid on Schweinfurt and ordering his crew to man ditching stations, Dud Ward managed to coax his aircraft across the Channel and land at Tangmere. The problem is, however, that the sortie list (or Form 541) has no record of Ward or his crew having flown that night. So while it appears most likely that it was indeed the Schweinfurt trip on which Ward won his DFC, there is contradictory evidence and thus some doubt remains. I came across this quandary while I was writing my 467 Postblog series. Being early May at the time, I was pushing the deadline to publish the post so I had no time to find other sources to swing the balance one way or the other. I had to make do with a short description of the problem, and moved on. And there the not-quite-satisfactorily-resolved issue remained, largely forgotten. Until I recently started to dig into the large pile of stuff that has been accumulating on my desk (and on my hard drive), waiting patiently for me to find time to go through it properly. By the way George Jones’ pilot was notified today that he has won the D.F.C. for a very good show he put up on the return trip from Schweinfurt on 26.4.44. Jones was a good friend of Arnold’s, and his name appears frequently in his letters. Reading this line set off a small bell in my memory. Could George Jones’ pilot have been ‘Dud’ Ward? He most certainly was. The crew list is in the ORBs (though not for the Schweinfurt raid!). And, sadly, both Jones and Ward are buried at Forest-sur-Marque in France, just a few miles east of Lille, the city they were attacking when they were killed two nights after Easton wrote his letter home. “George Jones – best pal gone”, wrote Arnold in his logbook the next day. So, satisfyingly, the ambiguity in the ORB was solved by another primary source, one that came from an entirely different place. I still have almost a hundred of Arnold’s letters to read – what else might I find? 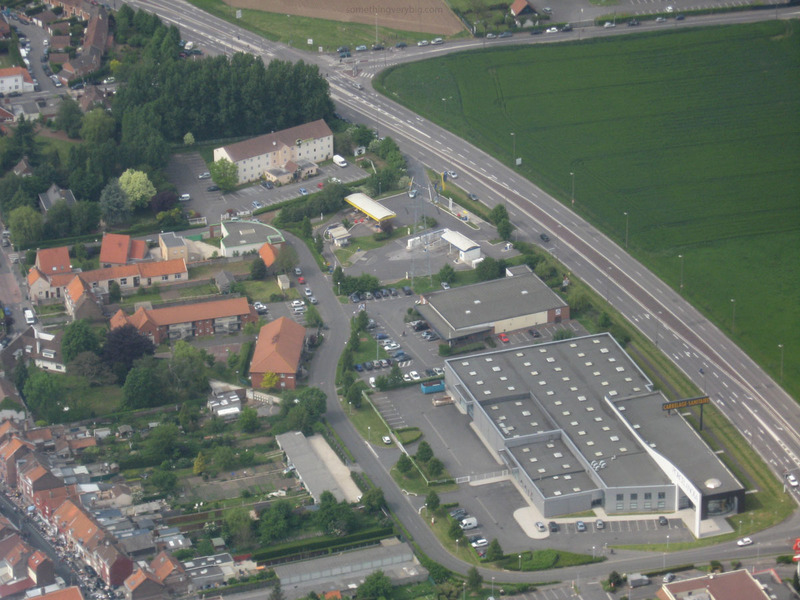 Five miles south-east of the centre of Lille is an airport. With an instrument landing system, VOR/DME and a main runway 2825m long it is now more than capable of handling aircraft up to about Boeing B767 size, and indeed today you can catch a flight direct from Lille to some 70 destinations around France, Europe and northern Africa. About ten hours short of exactly sixty five years after Phil Smith stumbled onto the boundary fence of an airfield near Lille, I was in a car being driven by my friend Olivier Mahieu across the boundary of the same airfield. We had spent the morning at the graves of the crew of B for Baker and Olivier had organised for me to go flying in a light aeroplane with a local instructor. His sister Sylvie came along in the aircraft to act as translator. 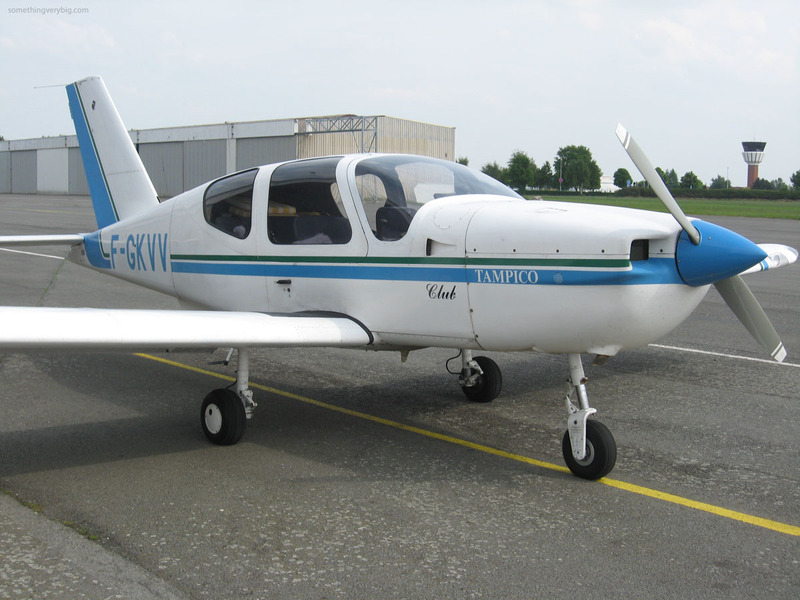 The aircraft was F-GKVV, a TB-9 (a French design, unsurprisingly), a type I had never been in before so I enjoyed the chance to fly something a little different. Though English is the international language of aviation, the local air traffic controllers use French if you’re flying in a French-registered aeroplane. Which is fair enough, but can present some problems if you don’t speak French. The instructor pilot – whose name was Frank – had English as non-existent as my French and I could barely hear Sylvie’s translation over the headset, but with much gesturing going in both directions between Frank and myself we managed reasonably well. Flying, particularly in a weird aeroplane in a foreign country, is always good fun. But this flight was memorable for more than just this. Because this was the same area where, sixty five years before, the crew of B for Baker had been flying in a Lancaster. Not long after taking off we were already over Lezennes. 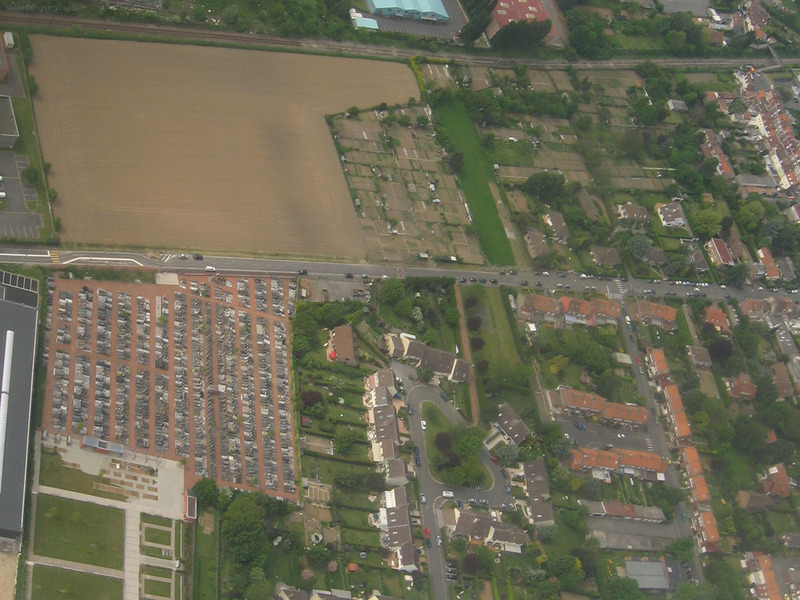 The cemetery where we had spent the morning was clearly visible down below. And not all that far away I could see the petrol station and hotel that are now built on the site where B for Baker crashed. The crash site of LM475 B for Baker – between the motel and service station at top centre. 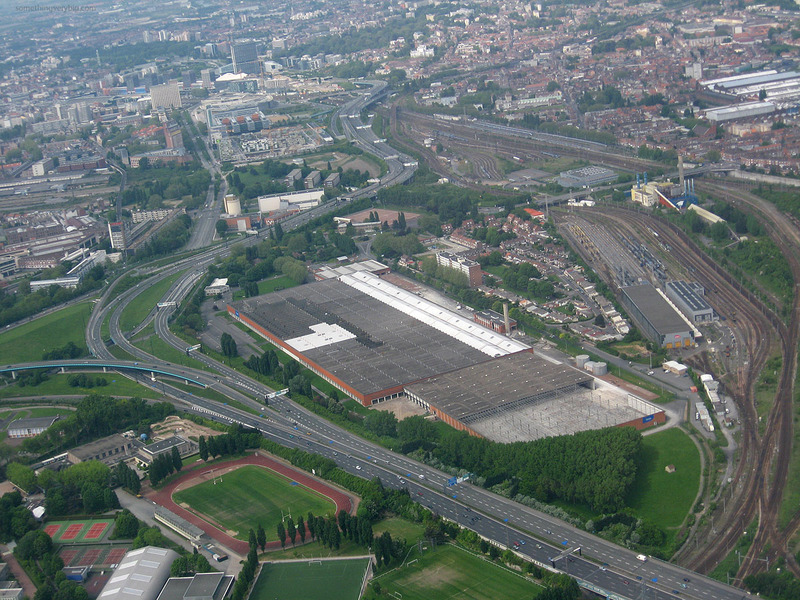 And also visible, a mile west of the crash site, were some of the big sheds and railway yards that formed part of the target that night. The Fives marshalling yards are the further set in this photo, just above centre. Though the passage of time has unavoidably altered the landscape as more areas have been developed and the suburbs have sprawled, from the air the relationship between the target, the airfield and the place where the aeroplane crashed stands out clearly. They really did crash very close to the target area. Flying over the same area where my great uncle Jack and his crew were lost was for me a profoundly moving experience. It can never come close, of course, to exactly what it was like that May night in 1944. 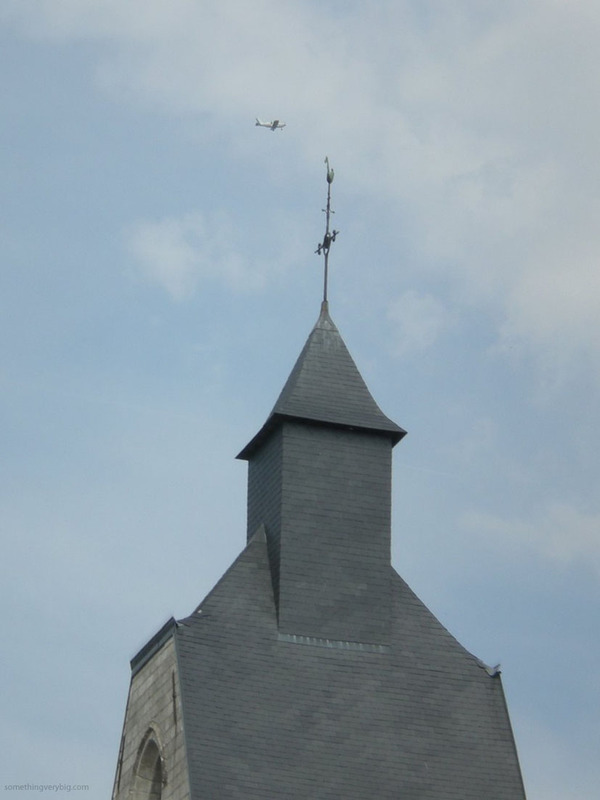 The weather was good, we were flying in daylight and, critically, no one was shooting at us. At 1,500 feet we were also considerably lower than where the Lancasters would have been flying. But to be in the air, over the same railway yards, was to feel for a moment just a little closer to the crew of B for Baker.